Ask Cassandra Clare and Holly Black your ‘Magisterium’ questions! Casandra Clare and Holly Black are about to go on the second leg of their European Magisterium tour where they’ll have signings in Antwerp, Belgium (November 9); Hamburg, Germany (Nov. 11. ); Cologne, Germany (Nov. 12.) and Vienna, Austria (Nov. 14). 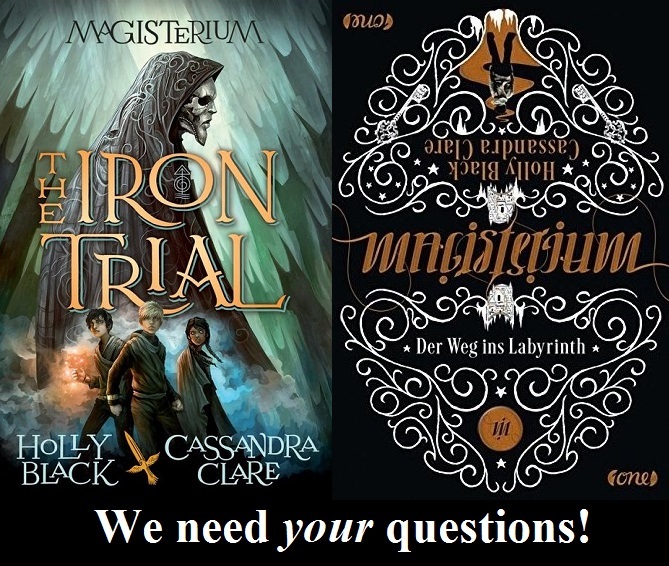 Thanks to the German publisher Bastei Lübbe, TMI Source will be interviewing Cassie and Holly on November 12 and we need your The Iron Trial questions! We’ll also try to ask a few questions about Cassandra’s and Holly’s other books. Comment down below with your questions (in English or in German) and we’ll pick the best ones for our interview. The deadline is November 9, 3 pm EST. 20 Comments on Ask Cassandra Clare and Holly Black your ‘Magisterium’ questions! What is the most exciting thing that is gong to happen in this new book that won’t give too much away? I wonder my Call is not positioned in the centre among the three of them and if the series will have matching covers? THEY SHOULD’VE COME TO THE NETHERLANDS! Hey! I’ve got some questions regarding TMI and some of them are about Magisterium. SO, here I go: Why didn’t Jace visit Clary in the Infirmary in CIty of Bones? And is Godfrey the guy un TBC cover? When will the Shadowhunters’ Tarot come out? If Jace and WIll met, would they like each other? Will you post extra or cut scenes of Cohf? And Cassandra Jean’s artwork and comics? Will you post the full cave scene some day? Have Jace, Izzy and Alec ever watched a mundane movie? When will Lady Midnight come out more or less??? I really loved this book, and now I have a major problem, because I’m addicted to this series, and there’s just one book out for sale of five, and the next one is scheduled for next year and I’m like adasfhbgviaufdshbivuadf. WHAT AM I GOING TO DO NOW??? OH DEAR GOD! It really bothers me that they compare it to Harry Potter, because in fat it’s very different from it. I think you’ve done a marvelous job! My question is, if Callum is the Enemy of Death and his Magic is binded, what is he going to do now? I mean, will he tell Master Rufus or Tamara o Aaron or someone? And is there a possibility of Call x Tamara happening? Because I already ship them… Oh, when will you reveal the next cover? I’m really excited! Will every book have an embossed sign on the cover? Because that’s really cool! Will you ever come to Barcelona??? Please, we are waiting for you two! Oh, and Cassie, good luck with your surgery. Thank you Holly and Cassie for writting such an amazing books!!! Angels Twice Descending: Someone lives and someone dies at Simon’s Ascension ceremony. hahahahah SOMEONE DIES WHAT THE HELL??!! PLEASE DON’T KILL SIMON!!! What does that even mean? OOOOOHHH AND IS RAGNOR REALLY DEAD????? will his knowledge about himself maje call act in a different way? i mean, change him somehow? and is he going to have flashbacks about his past as constantine? Is the series set in any particular time (same as release year, or some time earlier like early 2000s), or is it just meant to be ambiguous, or just random and irrelevant? When will the covers of Lady Midnight and TFSA come out? Do you some times wish that you hadn’t killed off Ragnor Fell so soon or before we got to know him. When I first started this book I thought Drew was like Neville Longbottem from Harry Potter. Then I read the twist and I completely changed my thinking. was that your intent? What does the Enemy of Death mean? The Enemy of Death is the villain in the Magisterium books. How would Aaron’s life be in magisterium over the summer and about havoc will Call take him home? My question is not on the iron trial, but more of the series itself. Well, actually I have two questions. First, did using the immense amount of chaos magic cause is Constantine to go insane (and not exactly evil)? When Master Joseph made the deal with Call in The Silver Mask he was expecting Call to bring Aaron back to life, he wanted it, but the deal said that if he brought Aaron back to life he would get to leave. So, was Master Joseph expecting Call to use a lot of chaos Magic well while attempting to bring Aaron back and expecting the chaos magic to mess with his mind so he would go insane too and want to stay? My other question is not quite related to the story but I have been thinking about it for some reason after it came to mind one day. What are the religions of the characters? I understand that it probably sounds weird that I’m asking this but like I said, the question just randomly came to mind one day and I’ve been thinking about it since. Sorry Kate, but this post is from 2014. Maybe contact Holly and/or Cassie online to ask your questions? Will there be a next book after book 5 of the Magisterium. I wish you would make another book(s) of the magisterium.